Stir fried chopped Garlic Scapes, onions, ginger in sesame and olive oils -- adding fresh Bamboo Shoots (from Week 1), shredded red cabbage, Pea Shoots, chopped mushrooms and leftover roasted chicken. Tossed with a quick sauce of tamari, Sriracha, rice vinegar, fish sauce, water, sesame and olive oils and maple syrup. Love this -- sometimes called a Japanese pizza, we adapted it more like one of our favorite Vietnamese dishes, Bánh Xèo. Sautéed shrimp with Green Garlic (from last week's haul) and Scallions in a little grass-fed butter. 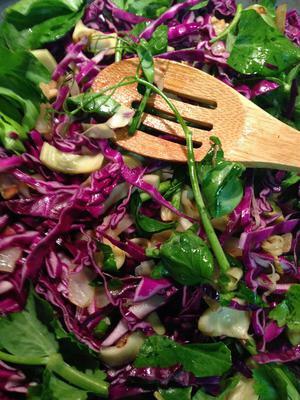 Sautéed chopped Garlic Scapes, mushrooms, shredded cabbage, Pea Shoots and peas in olive oil. Whisked together 2 eggs, 3 egg whites, sesame oil, tamari and gluten free flour. Spread vegetables and shrimp evenly in a hot large cast iron skillet with a little oil and butter. Pour egg mixture evenly over shrimp and vegetables, let set then finish in the broiler to brown top. Torn Leaf Lettuces, chopped Radishes, Scallions, grated carrots, toasted almonds, sunflower, pumpkin and sesame seeds, crumbled seaweed. Served with this amazing firefly chai tea with a touch of honey and splash of almond milk, chilled. Sautéed Radish Greens, Pea Shoots and Spinach with Scallions and Green Garlic in olive oil and grass fed butter. Mixed Greens, sliced Scallions, Radishes and cucumber, shredded cabbage, grated carrots, chopped roasted chicken, sunflower seeds, pumpkin seeds with feta dressing. Whisk together a simple nuoc cham sauce of lime, fish sauce, honey and Sriracha. Slice seeded cucumber and Radishes into strips, spoon some nuoc cham over and let sit while preparing other ingredients. Cut Leaf Lettuces, mint, basil and cabbage into ribbons and toss with a little nuoc cham and sliced Scallions. Quickly soak rice paper or bánh tráng (spring roll skins) and line the center with preceding ingredients. Top with crumbled grilled wild salmon, toasted seaweed and cashews. Roll and dip in remaining sauce.